Brush cutting is difficult and sometimes dangerous work, which means you don’t want to skimp on features that will make the job easier to handle. That’s why Little Wonder’s BRC 26 Hydro Brush Cutter goes beyond raw power by adding features that make it easy to use and care for. This brush cutter is powered by Honda’s single cylinder GXV390. The GX-Series is a popular powerplant for professional lawn equipment, and for good reason: everything about this motor is designed for maximum durability and reliable use so you know you’ll always be able to get the job done. An automatic decompression system makes the engine easy to turn over when starting, a large fuel tank lets it run for long periods, and a dual element air cleaner reduces maintenance. This motor also comes with Oil Alert, which will shut the engine off automatically if the oil level is too low, protecting the motor from serious damage. The engine drives a Hydro-Gear T2 transaxle. This unit has a built-in fan to control fluid temperatures and sends power to the wheels via a pair of ¾ inch solid steel axles. It provides the BRC 26 with a top speed of 4.2 mph when moving forward and 1.7 mph in reverse. A single belt connects the engine to a quarter inch thick, 26-inch wide tempered spring steel cutting blade. Together, this blade and motor combination can cut through saplings up to two inches in diameter and can mow down plants up to 5 feet tall. The blade is shielded by a 30-inch wide deck. The blade is held in place by a one-inch diameter spindle that rides on a pair of sealed ball bearings. In turn, these bearings are held in a large welded steel flange that both resists impacts and protects the bearings from moisture. Both bearings can be greased at the same time using a single zerk fitting. Surrounding this powerful equipment is a frame, deck and handle made from a combination of welded 7, 10 and 12 gauge steel. The front of the brush cutter is supported by a pair of 1.5-inch wide skid shoes made out of ¼ inch plate steel which can be adjusted to set the cutting height anywhere between 3 to 5 inches. The back of the unit is supported by a pair of 16-inch foam-filled puncture proof tires with bar treads designed for traction on dirt. The transaxle is clutchless and can go from forward to reverse without using a shift lever. For easy operation, Little Wonder designed the speed control as a lever that can be closed against the handle to go forward or pushed down with a small thumb tab to go in reverse. Worried about having the BRC 26 run away when mowing difficult terrain? There’s a limiter dial on the handle that lets you set the maximum speed so it never moves too quickly. When the work is done, a parking brake keeps the brush cutter from rolling, while a bypass control located at the base of the handle allows the transmission to be put into neutral, making it easy to roll into sheds or onto trailers. The handles are surrounded by a wrap-around hand guard, protecting the operator when working near bushes, trees, and fences. Every control is connected using metal rods, eliminating issues with maintenance and failure due to pinching and rusting associated with cable-operated controls. Little Wonder guarantees the BRC 26 for two years of commercial or rental use, while Honda backs the engine with a three-year warranty. Need to have your BRC 26 serviced or just need some parts? 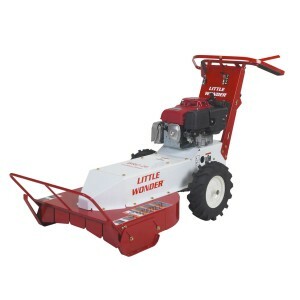 Shank’s Lawn Equipment is a certified dealer for both Little Wonder and Honda, and with over 30 years helping customers with their outdoor equipment, you know we’ll do the job right. Stop by our shop, located at 4900 Molly Pitcher Highway in Chambersburg, PA. That’s just off Route 11, or take Exit 10/Marion from I-81 and drive one mile east. We also ship parts across the U.S. and Canada so we can send you anything you need to keep your brush cutter working. To order, visit www.shankslawn.com. This entry was posted in Uncategorized and tagged BRC-26, Hydro Brush Cutter, Little Wonder. Bookmark the permalink.